The FBI wiretaps of Blagojevich’s phone in late 2008 were obtained by the Chicago Tribune, which released them Monday night. It’s the latest of various calls in which the men play out scenarios as to who Blagojevich should appoint to the U.S. Senate seat vacated by President Barack Obama when he went to the White House. Pritzker: I got a great idea for you though. Pritkzer: I’m sure you, I’m sure you thought of this one, but: Jesse White. Even though I know you guys aren’t like, you know, bosom buddies or anything. It covers you on the African American thing. Pritzker: He’s totally, he’s totally, you know … he’s Senate material in a way that Emil Jones isn’t, if I may say. Pritzker: I mean, you know, he’s just, I don’t know how to say it exactly. But Emil’s a little more crass. Pritzker: Um, and, it opens up the Secretary of State spot, which is the key spot that controls jobs, etc. And it would be a lot less pressure on you. You don’t have to put an African American in that spot. Pritzker: Of all the African Americans I can think that are sort of like, qualified, and vetted, and people will say ‘Oh, that’s, you know, that’s a pretty good pick.’ The one I, you know, that’s least offensive and maybe gets you the most cause it gets you that Secretary of State appointment, is Jesse White. Blagojevich: You can argue, he’s, you know, he’s got a lot in common with Obama. He’s black and white. Ha. Blagojevich: Huh. How stupid is that? Pritzker: That’s good, that’s good. Blagojevich: Hey um, no, he’s a good, he’d be a legitimate pick. Pritzker: I’m not pushing anybody. Blagojevich: No I understand. What you’re saying there makes perfect sense. He has said he doesn’t want it. It was known at the time that the feds had their eye on Blagojevich. Pritkzer says he was talking with the governor because he was responsible for filling positions, and Pritkzer says good can be done if good people serve in public office. Pritzker, an heir to the Hyatt hotel fortune who has spent at least $42 million in his bid to get the Democratic nomination in the governor’s race, says he wasn’t his “best self” on that call, which he says doesn’t match the values his parents taught him, and those by which he tries to live. 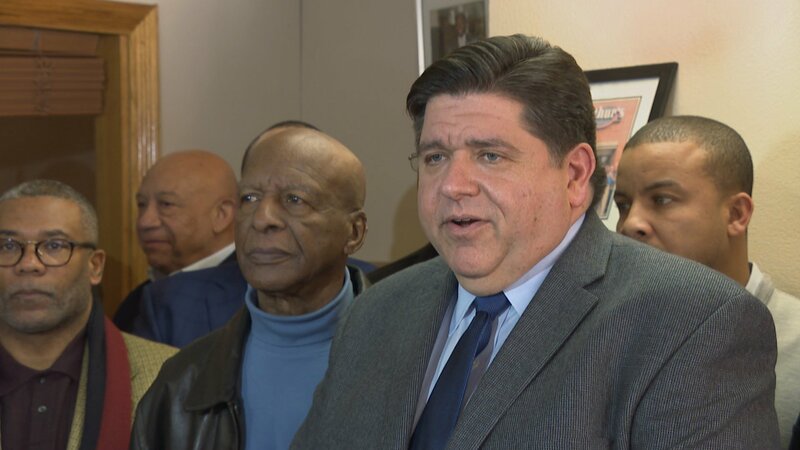 “While I may have had a call that portions of which I regret, and portions of which I should have pushed back on the governor about, and I apologize for those things, I also know that I will be a great fighter for the people of Illinois,” Pritzker said Tuesday afternoon at soul food restaurant McArthur’s in Austin. Pritzker says he can’t recall who initiated the phone call, how often he spoke with Blagojevich, and he doesn’t know whether he’s on any additional tapes. He says there were a lot of moving parts in politics at the time; in previously leaked conversations, Pritkzer was jockeying to be appointed state treasurer should that post become available. In the latest call, Pritkzer says he was advocating for Secretary of State Jesse White to be made a U.S. Senator; Pritkzer says he believed then and now that White would make a good U.S. Senator. A lot of ears perked at Pritzker’s saying White is the “least offensive” – language critics say is demeaning. White, who like many Democratic party leaders is backing Pritkzer in the crowded primary race, says he accepted Pritzker’s apology when he called Monday night, and he stood Tuesday with Pritzker at the press conference. “I’ve had the great pleasure of knowing J.B. Ptizker for almost 40 years I know where his heart is, I know where he is, I know about our relationship and I was not offended by it. He apologized to me, and that was good enough,” White said. Various other black elected officials also literally stood by Pritzker’s side. “He has a personal conversation with a governor, who he know, about some peope that he know personally and he just said what he felt personally. It wasn’t a public conversation, it wasn’t talking about the whole African-American community, it was about some individauls, and personally I am, I think, I’m a little perturbed that people are trying to play on the African-American community’s emotions, they’re trying to spin this thing like we stupid, like somebody’s trying to talk about us,” said Ald. Walter Burnett (27th Ward). Not everyone has been so accepting, though, including Pritzker’s primary opponents. "Our true character shows when we think no one is watching. JB’s conversations with Blagojevich are disqualifying and they’re a reflection of his integrity. The language he used to marginalize the African-American community is unacceptable,” Kennedy said in a statement. Feb. 5: Gov. Bruce Rauner’s challenger, state Rep. Jeanne Ives, R-Wheaton, says she’s been surprised by the “hysteria” surrounding a new ad her campaign released Friday. Jan. 25: Who will take U.S. Rep. Luis Guiterrez’s place in Washington? A preview of that highly competitive contest and others coming up next month. Jan. 24: The gloves came off Tuesday as Democratic candidates for governor faced off on TV. Carol Marin and guests discuss the latest on that race, and the crowded Democratic field for attorney general.